Her changing priorities led her down the path of Toe Grips. 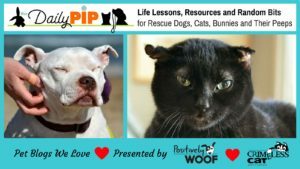 Her client told her he was working on other passion proudcts and that his heart was not in it for what it would have taken to bring the product to market to help other dogs. “He said, ‘If you can help other dogs, be my guest.’ I felt like I’d been given a Nobel Prize winning product,” she said. Dr. Buzby calls herself an “accidental entrepreneur.” “I didn’t set out on this path, but when it was placed before me I felt compelled to follow the path to help change the lives of senior dogs. I am not the toe grip inventor, but I am the toe grip cheerleader!” she said. From childhood, Dr. Buzby said, she has always had a heart for the underdog. 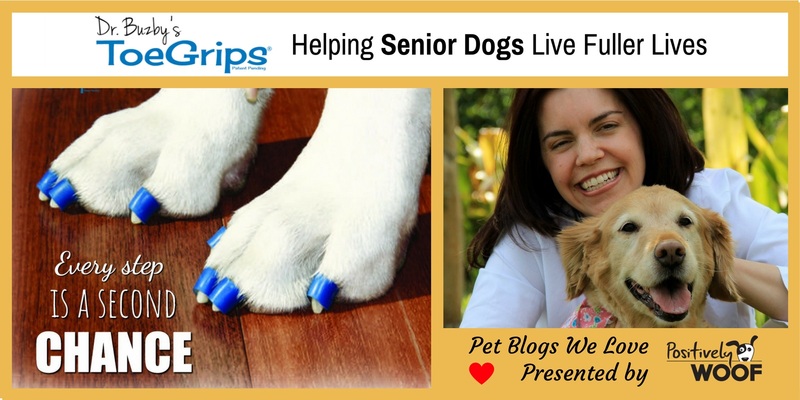 “I am drawn to senior dogs because they have lived full lives and have been such faithful companions for so many years and when they get old they struggle with mobility and mobility is a dog’s greatest asset,” she said. “I want to see senior dogs be successful and be involved with their families for as long as they can.” Through providing chiropractic and acupuncture treatments for aging pets to help them regain mobility she knows that keeping the senior pets active is crucial to their quality of life and now Toe Grips assist with that. 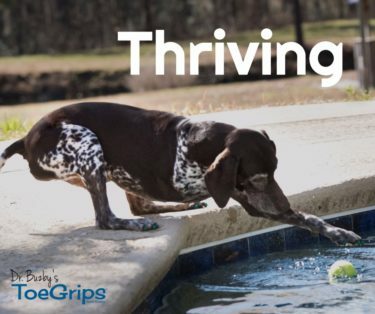 Dogs don’t need to adapt to wearing toe grips as they do to wearing shoes or booties, Dr. Buzby said adding, toe grips let them live and walk naturally. “When you cover your dogs feet with boots or socks you remove their ability to interact with their environment. Shoes or booties decrease a dog’s natural ability to ‘feel’ the ground beneath them with their proprioception receptors. These receptors are in the toes and pads and provide feedback to the dog’s brain as to where his body is and it helps them walk and remain upright.” Putting booties on a dog puts a barrier between his pads and the surface upon which he is walking. 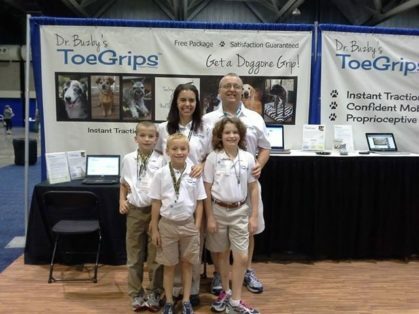 Of all the heartwarming and life changing moments Dr. Buzby has been involved in because of Toe Grips is the story of Gus. 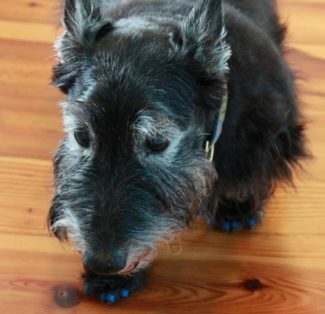 “One of the early dogs I put Toe Grips on was Gus, a fifteen-year-old Scottie. He was owned by people who loved him very much and had an estate and a caretaker for Gus because they traveled a lot. I worked with Gus’s caretaker, Frank, and asked if I could put some Toe Grips on Gus. Frank said, ‘Sure, let’s do this!’ Frank carried Gus up the thirteen stairs from our front door to our house, I put the toe grips on Gus and set him down and he went tottering off on our hardwood floors. Frank got emotional and teary-eyed because he said Gus hadn’t walked like that in months, in fact he’d been unable to make it across the floor,” she shared. “Gus had also been diagnosed with cancer and his family was thinking he was nearing the end, but Frank brought him back every month to replace the toe grips. Many months into the visits, Frank got out of his car and Gus hopped up the thirteen stairs – this is a dog who couldn’t walk and now is kind of spryly jumping up my stairs! Frank said, ‘We haven’t changed anything else in his life, but the Toe Grips did change his life because he could once again walk and be more active.’ Gus was using muscles he hadn’t used in a while and he was getting back into the groove. You know, it’s about the ‘move it or lose it’ lifestyle and Gus started moving it.” He did pass away from cancer, but prior to that he lived a more active and fulfilled life, she said. 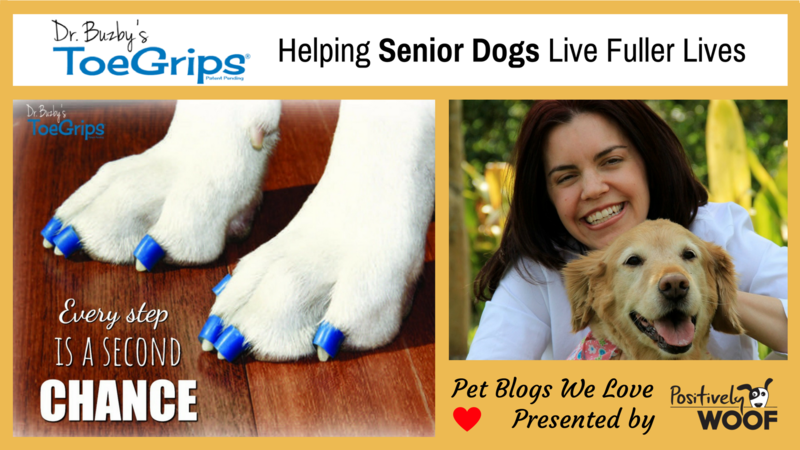 >Learn more about Pet Blogs We Love. >Learn more about Toe Grips.